LOWELL — Playwright Bob Clyman doesn’t waste time. 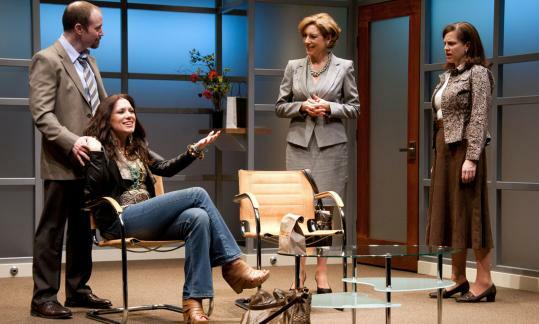 Within the first five minutes of “The Exceptionals,’’ which is having its world premiere at Merrimack Repertory Theatre, he digs in to moral and ethical questions framed in a remarkably straightforward context. What makes this play “exceptional’’ is Clyman’s ability to create a fairly humorous setup, and then ratchet up the tension to transform a simple story into a high-stakes drama. “The Exceptionals’’ takes place in the office of a sperm bank specializing in matching women with chart-topping IQs with “über sperm’’ to create exceptional children. Single mom Gwen (Carolyn Baeumler) is a needy, nerdy, all-but-dissertation research scientist, stuck in the office waiting room with Allie (Catherine Eaton), a tough-talking, leather-jacketed, high school graduate whose reading material is Danielle Steele. Although they are polar opposites, both women were selected for the sperm bank’s longitudinal experiment in eugenics. The result is that they are the mothers of 5-year-old boys who are already solving quadratic equations while other kindergarteners are learning their ABCs. The moms are waiting to meet Claire (Judith Lightfoot Clarke), a type-A psychologist and researcher who tells them the boys are being considered for the first class in an exclusive school for “exceptionals’’ that will “unlock the full potential of a child’s mind.’’ Complications revolve around Gwen’s neurotic approach to motherhood and Allie’s husband Tom’s (Joseph Tisa) feelings of inadequacy as a father. Director Charles Towers deftly guides his quartet of actors into surprising moments of connection, revealing unexpected nuances in characters that, on the surface, appear to be simple stereotypes. Of course, they couldn’t have done this without Clyman’s taut writing, which plays into assumptions even as he overturns them. Claire, for example, is cool, controlling, and manipulative, scoffing at over-achieving parents who “take their children to see foreign films and tell them fruit is dessert,’’ and discouraging Tom’s interest in a second child who is just average. “Nobody’s taking average,’’ she says dismissively. “There’s no demand.’’ But Lightfoot Clarke also finds Claire’s fragility and allows us to see she’s poured her passion into this project when she discovered she couldn’t control the quality of her own family. Tom initially appears to be a bit of a dolt who is intimidated by his son’s intelligence and insists “not everything has to improve.’’ But Tisa never gets heavy-handed, and Tom’s love for Allie and generosity toward Gwen add another dimension to a man who has been sidelined in the parenting process. Baeumler’s Gwen and Eaton’s Allie soften the edges of their concerned-mommy outlines. Gwen’s overbearing parenting style becomes more desperate as the play progresses, while Allie wrestles with making her marriage work and fulfilling her own needs, as well as her son’s. Although Gwen and Allie are at the heart of the play, their struggle revolves around deciding, not what’s best for them, or even for their family, but what’s best for their exceptional children. “There is nothing you wouldn’t do for your child,’’ Claire says. How far would parents go to help their child get ahead? How do they know they’re making the right choices? The Merrimack’s production of Clyman’s “The Exceptionals’’ creates excitement and suspense around the most basic parenting questions. Directed by: Charles Towers. Sets, Judy Gailen. Costumes, Deborah Newhall. Lights, Brian Lilienthal.